Raw sprouts are a much beloved salad and sandwich fixture for many. But a new outbreak of Salmonella—traced to raw sprouts that were served at several restaurants belonging to the sandwich chain Jimmy John’s—highlights their unique risk. On Friday, The Centers for Disease Control and Prevention (CDC) and the Food and Drug Administration jointly announced that at least eight people so far have been infected with a similar strain of Salmonella Montevideo in Illinois, Wisconsin, and Minnesota. 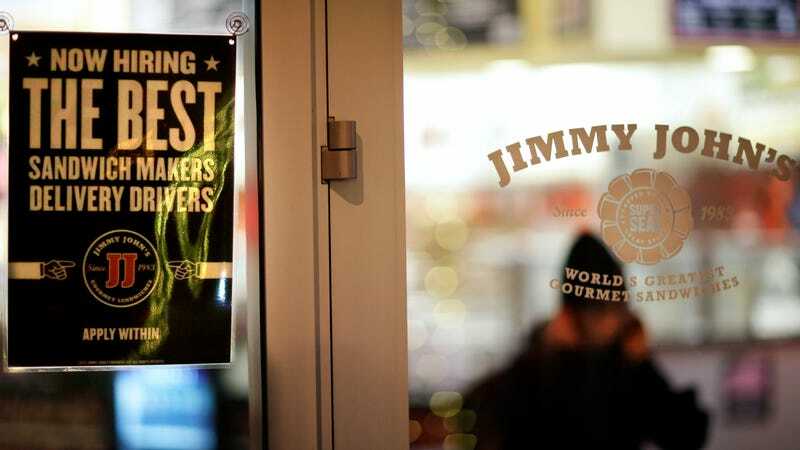 Seven became sick soon after eating a meal that contained raw clover sprouts at a Jimmy John’s location in Illinois and Wisconsin. The first case occurred in mid-December, while the most recent case began on January 3th. Luckily, the cases have all been relatively mild, with no reported deaths or hospitalizations. Both agencies advised that people stop eating raw sprouts at any Jimmy John’s restaurants in Illinois and Wisconsin. Jimmy John’s took it one step further, announcing that same Friday that it was temporarily pulling raw sprouts off the menu at every one of its over 2,000 locations. Salmonella Montevideo is one of the many types of Salmonella that can make our stomach a living hell. People can develop diarrhea, fever, and cramps 12 to 72 hours after being infected, which usually lasts around four to seven days. Those who are very young, old, or immunocompromised, like pregnant women, are especially likely to become severely sick. Though Montevideo usually gets to us through contaminated chicken or spices, raw sprouts have long been a favorite conduit of foodborne illness, thanks to its very nature. The seeds that eventually become sprouts—before they’re harvested—can provide a hardy hiding spot for foodborne bugs like E. coli to survive conventional decontamination methods. Afterwards, the humid warm environment needed to sprout them also ramps bacterial growth into overdrive, making each contaminated sprout into a ticking time bomb. These bacteria can be easily killed through cooking (washing them barely does anything), but just like with raw milk and water, some people love food that hasn’t been sullied by the stain of modern technology. As a result, raw sprout outbreaks have become a fact of life. According to data collected by Colorado University, there were 49 foodborne outbreaks traced to sprouts documented from 1998 to 2014; and over the last 18 years, upwards of 100,000 people may have been sickened from eating them. Food safety experts have called for an universal warning label to be attached to any sprout product, while other grocery chains like Kroger have opted out of the raw sprout game altogether, deeming it too risky. But given how popular a menu item they remain, it’s unlikely raw sprouts will lose their shine anytime soon.